I actually have what is called a 'retained bicuspid.' I am 43 years old and still have a baby tooth that never fell out! No permanent tooth ever formed. The baby tooth was crowned many, many years ago. When I had braces in high school, it was decided it should be re-done to match the size of a permanent tooth. It was re-sized and crowned again. Over the years, the root has disintegrated to nothing. The tooth is just wedged in there. Every hygienist is always in awe that it hasn't fallen out yet. Every dentist always talks pulling it and getting an implant. It isn't loose so leave well enough alone!! I'm sure it will fall out eventually, then I'll have to get it fixed. I've had nightmares about loosing that tooth my entire life!! 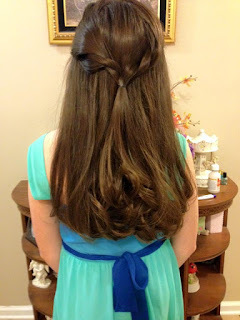 Valerie went to her first school dance - a Winter Formal - last night. She was so excited and planned every detail of her outfit for days. She looked so lovely and so grown up. Sigh. GOODNESS NO she did not go with a boy. I'm not ready for that and she is only eleven!! She met her group of girl pals at the dance. She has some great friends. They are all nerds and revel in being the smart kids. They had a great night! There's actually a story behind the dress. Mid-summer, we went to the mall just because. We always go to the third floor at Dillard's just to look. Val spied this dress. Now my girl NEVER wears a dress. I mean never. For some reason, she begged to try this dress on. Then begged me to buy it. Um no. I wasn't about to spend $60 on a dress for no reason and no place to wear it. Well, months later we found out my neighbor's daughter was getting married in November, and Valerie needed a dress for the wedding. She timidly asked if we could go back to Dillard's to see if they still had "that dress." I said okay, but thought for sure it was long gone by now. Don't you know there was ONE dress left and it was Valerie's size AND it was on clearance for $21?!? It was meant for her. I wish she'd let me do something else with her hair. She has gorgeous hair. It's almost down to her waist and is super thick and shiny. It's a pony tail or a braid - always. See how pretty it is when it's down??? She refuses to cut it. I have to bribe her to let me trim the ends. Last summer we dyed the tips BLUE with Manic Panic. I secretly was hoping that the dye wouldn't fade and we'd have to chop a few inches off before school started. Didn't happen!! It's always so tangled. Oh well. It's her hair I guess. At some point, I'm sure she will decide it's time for a hairstyle change. I did low carb for a good while. No sugar. No rice. No potatoes. No bread. No fruit even. Once you get past the first week or so, it's a breeze. It really works and I can honestly say I felt much better. I felt lighter. I didn't feel as tired and after a short time, the carb cravings vanish. Saying no to a cookie doesn't phase you. That's right - carb cravings go completely away. Forget about everything you've been told about eating low fat - it doesn't work. All the low fat options in the store are loaded with carbs and people in general have gotten heavier because of it. Reverse your thinking to eating low carb / high fat as being good for you. You can eat all the cheese you want -- even cream cheese (cheese cake even!) Pork rinds. Bacon as much as you want. Real butter and heavy whipping cream are your friend. (It may come as a shock but there are so many people out there who do not even know what REAL butter is. Hint - it doesn't come in a tub.) When you slip up and eat a carby meal, you feel terrible. Bloated and sluggish and sick. It's something that you don't realize until after the fact. Eating junk slows you down so much and makes you feel awful. It might taste good but is it worth feeling crappy over?? After so long though, you just can't fathom another egg. Blech. Even bacon, yes bacon, gets old. Cauliflower was once an amazing as a potato substitute, but it too overstays its welcome. You tire of the prep work and planning for meals. Especially when you have kids who won't eat a low carb pizza, so you have to make something else for them. You have rice with your gumbo or a biscuit for breakfast. You bake a loaf of bread for breakfast because the eggs just turn your stomach. Then you say yes to the cookie, and that's all she wrote. I'm going to start again. Soon. Really. I've been enjoying a little break for a while now. Thanksgiving and Christmas are over. Mardi Gras is around the corner, and we do indulge in a King Cake or two. I will get back on track. I will make grocery lists, hunt for new recipes, and go back to my low carb cooking. I guess that is a loaded question. No, not really. We came up with Antarctica for a code word in case we needed to mention our upcoming vacation in front of the kids. What vacation -- Disney World!! Valerie and Veronica have no clue that we are going. It has been a tough secret to keep. Valerie talks about Disney almost every single day. She cried real tears when we told her we were not going to Disney this year. She's already asked if we can start planning our trip for next year. (sure, sure.) In the mean time, in secret our flights are booked. Park tickets purchased. Condo booked. Dinner reservations made. The plan is that Clint will announce he is going on a 'business' trip. It will just happen to fall the same week as spring break. I will complain about him being away the week the kids are out of school, so the solution will be that we will go with him. It shouldn't raise any suspicion since it is nothing out of the ordinary for him to travel since he is away so often. This way, the girls can pack their own suitcases. Both girls are planners and would panic if we sprung a last minute trip on them. 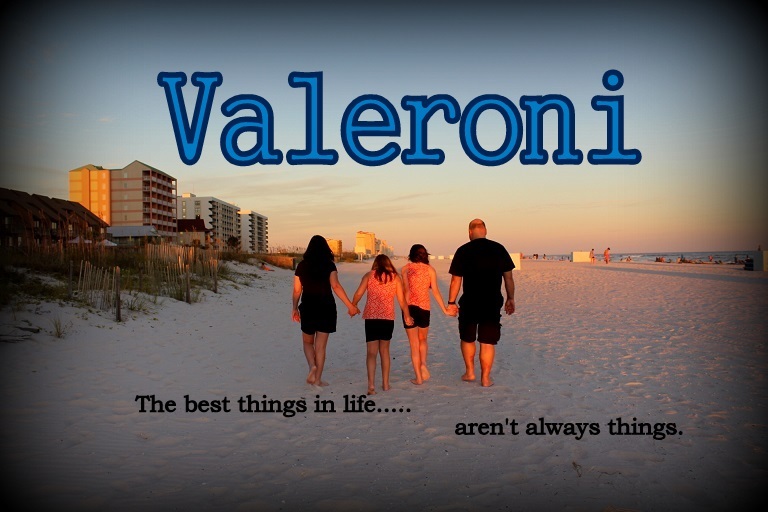 Veronica especially likes to bring certain things along and Valerie is a list maker. They will know we are getting on an airplane. They will just think we are going somewhere else! Another idea is to make us all matching Disney shirts. Clint and I could put ours on the morning we are leaving. We'd wake the girls up at dawn and see how long it takes for them to notice what we are wearing. I'd think Daddy wearing a Mickey shirt would be a dead giveaway!! I don't think we'd have any trouble getting them up and moving after that. As our trip inches closer, it's harder and harder to keep quiet. Valerie especially talks about Disney World nearly every day. She goes on and on and on about going back and what rides she will do first. I hope to get the big reveal all on video, so stay tuned!! I survived the sleepover!! It was complete chaos, but so fun at the same time. The things we do for our kids, huh?!? A few people cancelled at the last minute, and one kid was a no-show. We had pizza first, then we watched fireworks for a bit, then it was cake and present time. We put Val's mattress in the living room along with an air mattress, so the girls had a big camp out. There was lots of giggling and very little sleeping!! All the girls said they had a great time. My ValGal was all smiles, so that makes it worth while. Last night we went over to our neighbor's house for a New Year's Eve celebration. We ate a ton of junk, had a few drinks, and sat our by a fire while watching the fireworks. It was SO COLD but the kids had a great time. We came home just before midnight. I was completely exhausted and just wanted to go to bed, but we made sure to be outside a few minutes before twelve. We had a few rockets left to shoot and there's so many people shooting fireworks around that you don't want to miss it. It seems 2015 just passed me by.... I don't know where the year went. Not feeling well most of the time left me with many days of going through the motions. I felt so spacey and out of it so much of the time that I don't even remember half of what we did. I don't call them resolutions, instead I always try to make a few goals for the New Year. I've taken three weeks off from the gym, so getting back to it is my main goal. The gym used to make me feel so good, but since my surgery, it makes me feel awful to push myself. Dizzy and just a feeling of being "off." I enjoyed the break but after the holiday binge, it's time to go back and find my new niche. I hope to ride my bicycle more, also. I enjoy that a lot, but the weather doesn't always cooperate and it's hard to find the time. I try to make house goals every year also. De-cluttering is always number one. I'm always getting rid of piles of stuff, but it seems more takes its place!! I'd like to paint my foyer and living room this year. We have a semi-open floor plan, so it's a lot of wall space. The trim needs to be painted white also, along with the bedroom doors. I have yet to decide on a wall color yet, even though we've had paint swatches taped to the wall for months! Holidailies is over today. Thanks to everyone who came by to read and comment!! I got off track a bit and didn't blog daily. I think this is the first year that I didn't post every day. Another one of my goals is to blog more, so stick around to read about our adventures! !